I said last time that I was going to start being nice to carp anglers. I was digging back through a load of old photos yesterday and found this one. So I thought I'd ingratiate myself with the carp fraternity by posting it. 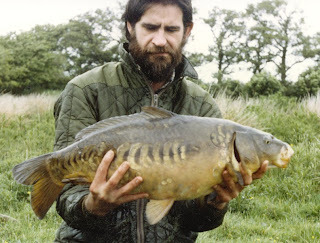 The fish was about fifteen pounds, I think, and caught using a 'proper' carp rod, not one of the casting sticks everyone seems to need these days. The rod was a Z-1 a really versatile rod for all sorts of fish. I've since gone on to catch a 23 on one of these rods while tench fishing. And there's some young carp anglers who think us old pikers couldn't cope with catching a carp... They ought to stick to polishing their rod pods and lining up their reel handles. I doubt any of you few, you happy few, you band of brothers... Enough already! I doubt if any of you care a toss about the trials and tribulations that have kept me from the water's edge for a week, but I shall inflict them upon you anyway. Monday to Thursday was spent awaiting callers of one sort or another every day. Some came bearing gifts (gifts as in £s - I like those callers), some failed to show (those I don't like), and some needed a kick up the backside to turn up at all. The latter was a delivery of belated blanks (although not all the ones I was awaiting), which meant that Friday to today (Sunday) has been taken up turning the things into fishing rods so that I can not go fishing again on Tuesday when I shall again be waiting in for a caller (my couriers) to take them away. Such is the life of a one man rod building outfit. Whole days wasted waiting for something that takes a few minutes to be over and done with - always seeming to happen at a time that makes nipping out for a few hours impossible. Impossible at this time of year when the evenings are still quite short, and there's nowhere local to fish into dark. Once the rivers open the problem disappears. I know I could get up early and fish for a few hours before starting work, but I lack the discipline. I'd either carry on having 'one more cast', or I'd come home feeling tired and have 'one more brew' before settling down to work - in other words leaving work for another day... It's not that I'm lazy. Just that fishing is more fun than working! Rod building entails a fair bit of waiting - for glues and varnishes to dry. Today I have used that time to stuff catalogues into envelopes. I put it off for as long as I can as it's so mind numbingly dull. This tedious process revealed that I didn't order quite enough catalogues to go round. So, anyone with a surname beginning with S to Z won't be getting one until I get some more printed. With all that lot out of the way and (I hope) the last few rods of the weekend spinning merrily on the drier I thought I'd have a look at the web stats for this blog. To my surprise this last month there's been a fair bit of traffic coming from a carp fishing forum. I guess I'll have to stop saying nasty things about carp and carp anglers! In fact I've already been thinking of taking up carp fishing. 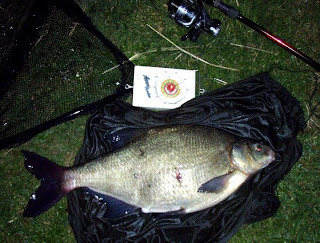 My reasoning being that carp anglers are always being pestered by big bream. Seeing as I can't catch bream when I fish for them perhaps fishing for carp will lull them into a suicidal feeding frenzy? We shall see - if I ever find the time to try. I get some rare old rods to repair. Rare as in odd looking, rather than scarce, that is. The one pictured below has to be up there with the worst. I'm all for making things look different - but there are limits. What gets me is the 1950s nostalgia vibe to it. Grey plastic and rubbery vinyl. I just had to share! I always think that spring has truly arrived when the blackthorn is in bloom. It's surprising how much further advanced the year is down south. Last weekend I travelled to Northampton and the bushes were white with blossom, yet back home the buds had yet to open. Using natures signs from the land can give you clues as to what the fish will be doing and I think that bream are a worthwhile option when the blackthorn is out, but tench become more viable when the hawthorn is in flower. So, on my way home from Northampton I called in at a pit for a few hours in search of bream. I hadn't fished the pit before so didn't expect much. I wasn't disappointed. I blanked. Although I did have a worm bitten in two. Yesterday I intended to make the trek south again and give the place a more serious assault. However I rose late. Having nothing better to do I set off anyway, arriving after noon but still with plenty of time to put some bait out and fish a few hours into dark. The plan was to spod out a load of pellets, mixed with some sloppy green groundbait to hold them in the spod. With the bait out to a marker float two method feeders were cast out on top of this into about eleven feet of water. The third rod fished a maggot feeder to a gravelly spot at the bottom of the marginal shelf just in case any tench were moving about. Sitting back in the sun with the light dancing on the ripples alternatively watching the water for signs of fish and the bobbins for signs of movement it was most relaxing. Far more so than the fly flinging I'd been indulging in on the local canal during the week. The concept of fly fishing, for trout as well as pike, has a theoretical and aesthetic appeal. 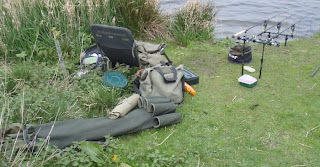 The thought of carrying just a rod, net and light bag is enticing when you have carried five rods, a rucksack and chair plus what felt like a ton of bait half way round a 20 acre pit. And the collecting, or creating, or 'flies' is an added bonus. I had bought some Alien Hair from Alex at Zoota Lures and done some messing about. Nice stuff to work with once you get the hang of it. As I said in another post there is a pleasure in the casting of a fly line, but sitting in the sun waiting for an alarm to sound is more my style these days. Especially when I'm blanking. Which is what I did on the bream pit. I was full of anticipation when the wind dropped towards dusk. I expected to see numerous dark rolling backs over my baited area and the bobbins dropping back like glowing yellow stones. It didn't happen. Just as it had got dark enough for the head torch to be required I had two 'bites'. One to a method feeder one to the maggot feeder. But they were only lifts of the bobbin that dropped straight back. Liners I suspect. I missed out on some good bream fishing last April because I couldn't string together three days to fit in a two-nighter. With Easter weekend approaching it looks like this year might follow the same pattern. Once the weather has warmed up enough to get the tench moving in earnest then day sessions become a viable option for decent fish - provided you can get up early enough to hit the water at dawn. The very thought of it makes me quail!